Kicking of the 2019 Fill a Glass with Hope program are (top, from left) George Stark, Cabot Oil & Gas; Dennis Phelps, Trehab; Gene Brady, Weinberg Food Bank; and Bill desRosiers, Cabot. 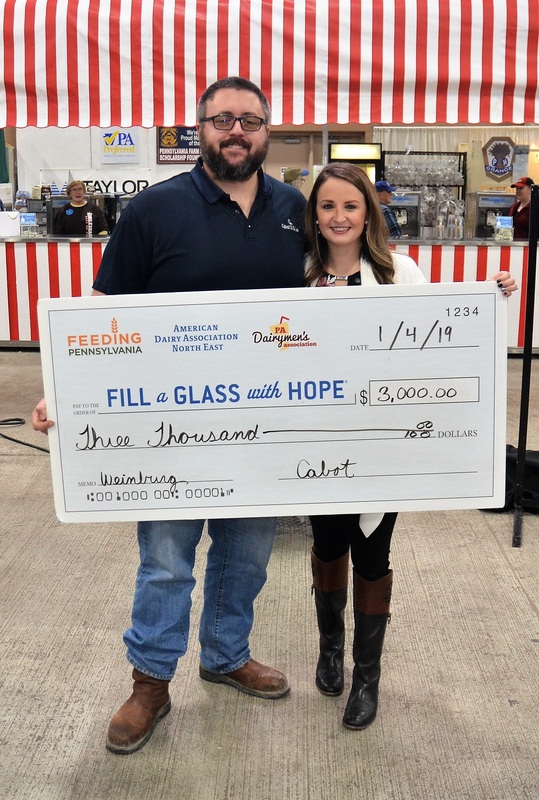 Feeding Pennsylvania executive director Jane Clements (above, right) accepts a $3,000 donation from Cabot Oil & Gas coordinator of external affairs Bill desRosiers for the Fill a Glass with Hope program at the recent Pennsylvania Farm Show. Six school districts in Susquehanna County benefit directly from the Weinberg Food Bank and Fill a Glass with Hope program. The food banks also assists 737 families throughout the county, amounting to 3,436 individuals receiving 5,265 half gallons of milk last year, as well as fruits and vegetables available at markets set up in the individual schools. School districts hosting Children’s Produce Markets include Blue Ridge, Elk Lake, Forest City, Montrose, Mountain View, and Susquehanna Community. “With the opening of the Children’s Produce Market at Lathrop Elementary School in Sept. 2018, every public school family in the county now gets a monthly invitation to receive fresh, healthy food at their schools,” said Gene Brady, executive director of the CEO Weinberg Food Bank, which serves 12,750 people each week in a four-county area. Most of the fresh produce stocking the shelves at the food bank originate with donations processed by the Mid-Atlantic Regional Cooperative at the port of Philadelphia. Shipping costs average 18 cents per pound. Milk must be purchased from local cooperatives, which is dependent on monetary contributions from companies like Cabot Oil & Gas. The Fill a Glass with Hope program is managed by Feeding Pennsylvania. Fill a Glass started in 2015 in the Pittsburgh area and soon went statewide. Feeding PA’s priorities simultaneously shifted to moving more fresh product, and milk was one of the most requested food items, according to Jane Clements-Smith, Feeding PA executive director. Milk’s relatively short shelf life doesn’t lend itself to efficient donation. 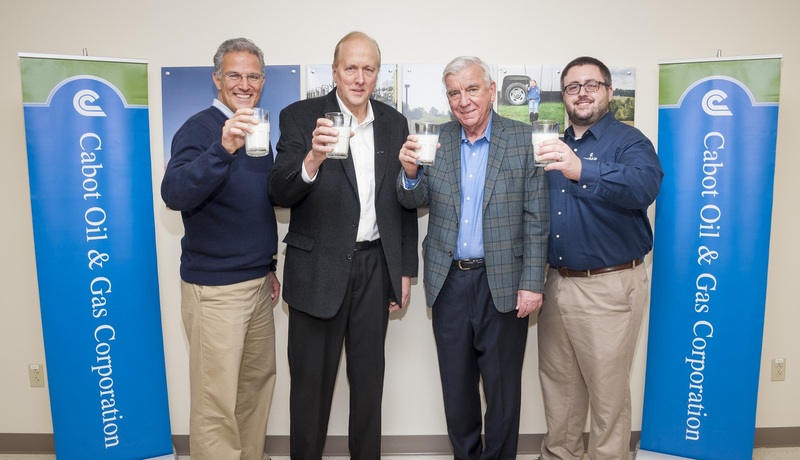 “We are are extremely appreciative of our dairy farmers and business leaders for investing in this amazing program so that the CEO Weinberg Food Bank can purchase milk at a reduced price,” Clements-Smith stated. 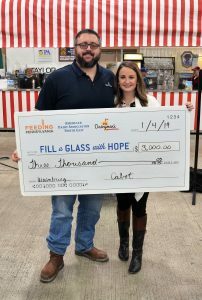 Cabot has partnered with the Weinberg Food Bank for the past four years to assist with the agency’s Fill a Glass goals. Brady noted that there are 74,370 “food insecure” people in Northeast Pennsylvania who, on average, run out of food two days per week. “Sadly, one in five children in the region are hungry,” he remarked. Corporate donations and public awareness are the keys to the Weinberg Food Bank achieving its Hungry to Healthy program goals by 2025. The support of Cabot has led to other donations and partnerships within the gas industry, but none have been as consistent as Cabot, Brady related.